A spokesman for House Intelligence Committee Chairman Devin Nunes fired back Thursday at reports playing up a "secret tape" revealing his warning to donors that a GOP majority in Congress may be necessary to protect President Trump. The comments, which aired on MSNBC’s “The Rachel Maddow Show” on Wednesday, were from a fundraiser for a GOP colleague. On the tape, Nunes, R-Calif., suggests congressional Republicans must prevail in the midterms to protect Trump from the consequences of the Russia meddling probe. [post_ads]“If Sessions won’t unrecuse and Mueller won’t clear the president, we’re the only ones, which is really the danger,” Nunes was recorded as saying. Nunes spokesman Jack Langer, in a statement Thursday to Fox News, suggested the response to those remarks has been overblown. 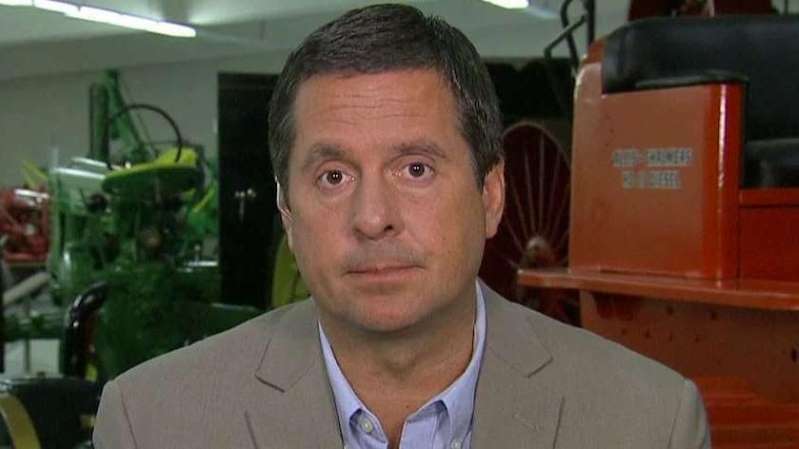 “It’s unsurprising to see the left-wing media spin Chairman Nunes’ routine observations as some nefarious plot, since these same media outlets spent the last year and a half touting a non-existent Russia collusion conspiracy,” Langer said. House Democrats indeed seized on the "secret tape."